For those of you who appreciate hot Asian men, Daniel Henney needs no introduction. When he debuted in the Korean drama My Lovely Sam Soon in 2005, he became an instant star. Since then, he’s acted in films such as My Father, X-Men Origins: Wolverine, Shanghai Calling, and Big Hero 6. In 2016, he can be seen in the American television show Criminal Minds: Beyond Borders. But let’s talk about Mango. 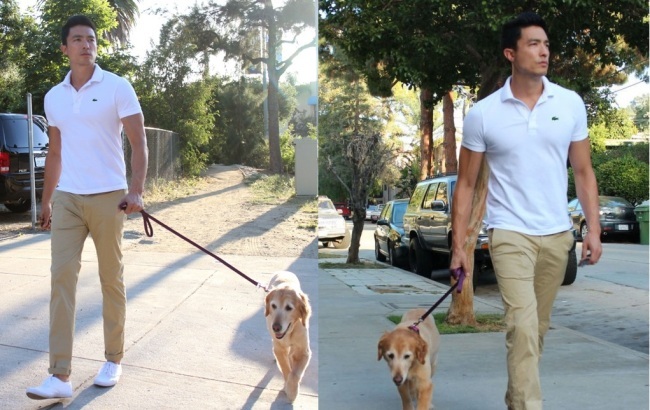 Mango is a golden retriever that often steals the spotlight from her famous owner, even when he is wearing white polo shirts that showcase his “luxury brand body,” like the Korean websites like to say. And she was both fashionable and supportive when Daniel dumped ice water on himself for charity in 2014. If you want to see more photos of Mango (with Daniel), check out Henney’s Instagram. Mango and Daniel pen deeply personal haikus below, in the most romantic of all the 2016 Haikus with Hotties Calendar exchanges. Met and fell in love? Winter in Seoul years ago . . . Eyes down, nose up, food. Thank you, my sweet girl.